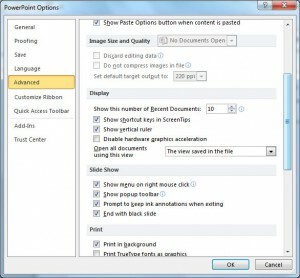 This feature allows you to use shape, color, pictures, and text to make a point visually in Word, Excel, and PowerPoint 2010 (and 2007). One way to work with this feature is to use the SmartArt button on the Insert tab. Another way is to use the Insert SmartArt Graphics button on a Title and Content slide layout in PowerPoint. If you have existing text that you’d like to convert to SmartArt, select the text, and then click the Convert to SmartArt button in the Paragraph group on the Home tab. There are over 80 SmartArt graphics to choose from in the SmartArt Gallery! The categories include List, Process, Cycle, Hierarchy, Relationship, Matrix, Pyramid, Picture, and Office.com. Please post your questions or comments below. Where is the More button on the Microsoft Office 2007/2010 Ribbon? 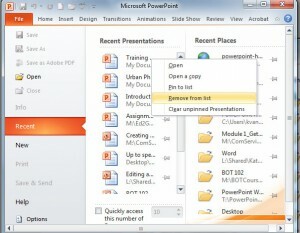 A student asked me the other day where to find the WordArt More button on the PowerPoint 2007 Ribbon. In this example, you can see three WordArt styles. Next to the three WordArt styles are three buttons which you may use to scroll through the various WordArt styles…one with an up arrow; one with a down arrow; and another with a down arrow with a horizontal line above it. I refer to the up arrow as the Previous Row button, the down arrow as the Next Row button, and the bottom button is the More button. 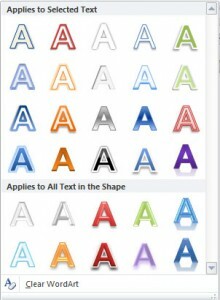 The PowerPoint theme determines the WordArt styles; so if you’re using a theme other than the default Office theme, your WordArt styles will look different from the above examples. If you need further clarification, please let me know!